Police in California say they have seized $1.7bn worth of marijuana plants in the Sierra Nevada mountains. They have also arrested 97 people over the past three weeks, most of them Mexican nationals believed to have ties with Mexican drug cartels. White House drug czar Gil Kerlikowske said police had found industrial-sized plantations of marijuana. Experts say Mexican cartels are increasingly growing marijuana in the US, rather than smuggling it there. 450 officers from local, state and federal agencies took part in the raids in the foothills of the Sierra Nevada in California. 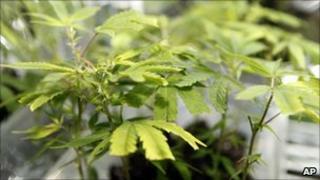 They found more than a hundred locations where marijuana was being grown illegally. Fresno County Sheriff Margaret Mims said the marijuana plantations were a danger to local residents, as the organised crime gangs behind them "don't just grow marijuana on our public lands". "They continue their criminal conduct during their off-season with other illegal drug and violent activities in our local communities," she said. Director of the White House Office of National Drug Control Policy Gil Kerlikowske said "tremendous devastation" had been done by the industrial-sized fields. He said eradication teams removed thousands of pounds of toxic fertilizers and rubbish from the sites.